← Sit Back And Relax! Remember “The Convo” I talked about in a previous post? (see https://imperfectlyperfect92.wordpress.com/2014/06/20/our-first-husband/ ) Yes, the details and all are out. Well, that’s story for another day but I can say with no fear of contradiction that “The Convo” will be an “all rounder” with a definite “godly flavour”. It will be executed on the Psychological, Environment and Spiritual Level, unlike any relationship event you have been to. It is PRACTICAL. It is RELEVANT and it is DEEP and I AM REVVING UP FOR IT! Sadly, my free tickets giveaway are all out, so please, see Tickets and event details are at http://www.afritickets.com/ and get your tickets. This event will be one of such “getting wisdom” + it is happening on the saturday immediately after my bar exams. It sure would make me light up with smiles and compensate me for the marathon reading for Bar part 2 to see blog readers I have never met before. It would be great, great, great! Please make my day and yours. The knowledge we will get will be off the rooftop, and Lord knows youths really need to get things right as regards relationships… And even as I planned to write this I just turned to one of my friends and asked him to come and he was like “nah, I don’t need it, blah blah blah”… those kind of stuff just makes me sad/want to give off my tickets to only guys but sadly, my tickets are all out. Please our ogas, please, get wisdom on relationships and marriages, nor be onlyon money. I cant count the number of guys I hear that talk about relationships and I am just amazed (not in a good way) with what comes out of their mouths. A lot of the cycles we go through in relationships will stop if we would only just transform our minds with godly wisdom. Please get your tickets here and attend this. Trust me, you wont regret it. How do you create the right foundations for lasting relationships? How do you manage attraction? Why is it that you seem to be hitting the same brick wall in relationships? How do you actually live out what you know God wants in a relationship? 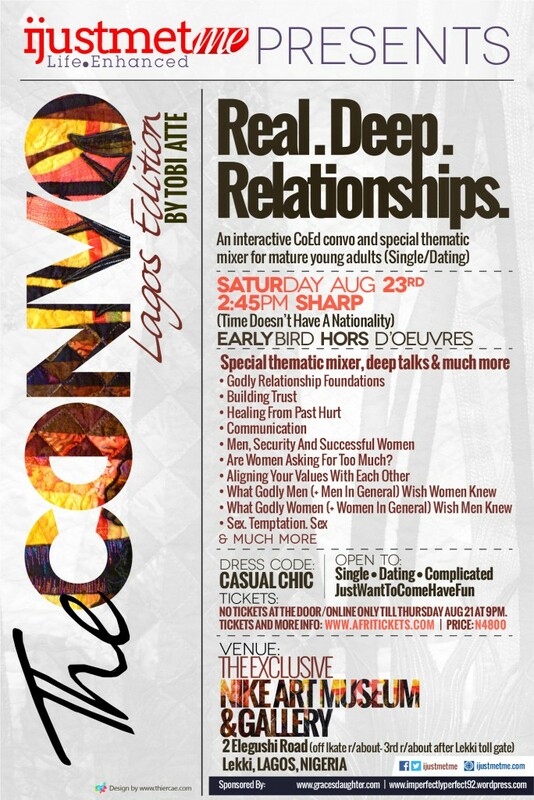 This will be an audience driven relationship conversation that no mature Young Adult should miss. We will be going deep. This is for big girls and big boys. These are the deep…juicy…real conversations people are aching to have but typically don’t get the opportunity to do so. Men’s perspective, Women’s perspective, God’s perspective. Featuring a special thematic mixer, deep talks and much more. As I type this, I have my earphones plugged in with Tobi Atte speaking at last year’s the convo and its amazing, I tell you. NO TICKETS AT THE DOOR/ONLINE, ONLY TILL THURSDAY Aug 21 AT 9PM. LIMITED SEATING. THE TICKETS WILL SELL OUT QUICKLY. GET YOURS ASAP. ****BE ON TIME. REALLY…BE ON TIME. SPECIAL THEMATIC MIXER WILL PROBABLY HAPPEN AT THE BEGINNING :o) We don’t think that Time has a nationality. Shebi I will see you there? *high five*! And uhm, for those asking, I am fine ooooh! I am doing great, it’s just that Bar exams is racing towards me with full force and I have to run with the times too. I will be back soon with some amazing stuffs… Funny how my eyes have been opened to soooo much during this period when I do not have time to write and publish. But no wahala, I will soon be back, I will share them then. And, yes! Happy New Month people! Its the 8th month already yeah? Well, here it is for you…. Feel free to fix your name in there like I did and just let that word sink into you and stop the “fear fear”/whatever you think maybe against you. God is in charge of your story. ONLY GOD RULES OVER YOUR AFFAIRS. I will expatriate on the Rhema I got from that word/bible verse when I come back fully. For now, till I come your way next time, God loves you and so do I…. 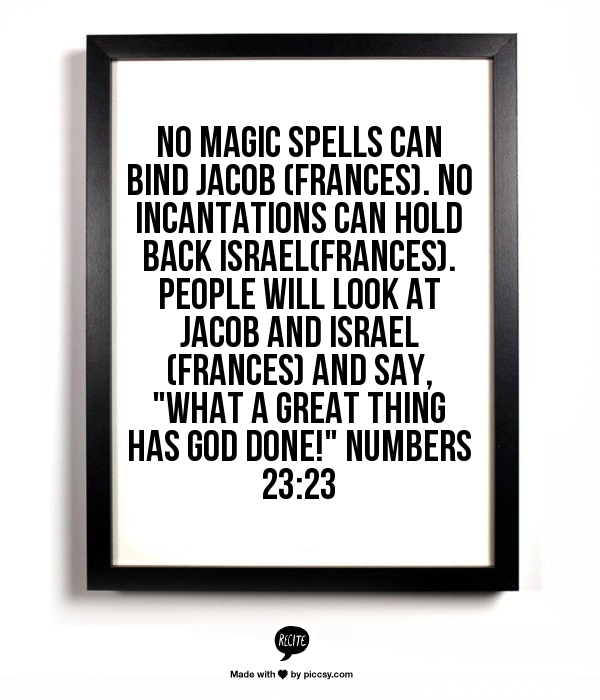 Hehe, that sounds so cheesy, it’s what Pastor Ayo Oristejafor says at the end of his broadcast…. But seriously, I do love you guys. I will see you on August 23rd God willing. Hey Frances! What app did you use for that wall paper stuff? Hello Mo, sorry for the delay..i used recite for the quote thingy. Success in your Bar 2, Amen! Success all the way dear and yes, we miss you here! God’s best in your exams dear. Thank you so much everyone. I appreciate you all for your care. I just said the prayer.